If you drop a pebble into water, ripples travel outwards through the water. Sound works in a similar way. 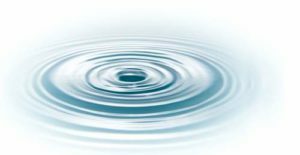 The ripple travels through air and rather than seeing it we hear it. Below is a side diagram of a speaker. The inside speaker cone vibrates back and forth, causing vibrations to travel through the air called sound waves. A speaker cone is similar to an eardrum, but instead of projecting sound it receives it. This means the eardrum is sensitive as it’s moved by vibrations in the air, so look after yours. The same is true for any sound, not just for speakers. Sounds are made from some kind of movement, which makes the air around it move. For instance when you pluck a guitar string, the string vibrates causing sound waves in the air. When you close a car door the impact causes sound waves in the air. The difference between noise and music is that noise is random disorganised sound, while music is sound organised into patterns, which have pitch and rhythm. How low or high a note is (in other words its pitch) depends on how frequent the sound waves are. The more frequent the sound waves the higher the pitch, the less frequent the lower the pitch. This frequency is measured in Hertz (Hz), which is the number of sound waves per second. For example the frequency of 500Hz will be higher in pitch than 200Hz. Almost all sounds actually consist of a number of frequencies; the Fundamental and Partials. The main factor that makes a guitar sound like a guitar and and a trumpet sound like a trumpet is the relative volumes between the harmonics. As a note fades, the various harmonics can also lose volume at different rates dependant on the instrument. Another factor can be slight deviations in frequency from what would be exact harmonics, yet not deviated enough to make the fundamental unrecognisable as a pitch. Electronic synthesizers can play a single frequency without partials and instruments can be synthesised by adding partials. Inharmonic partials are frequencies above the fundamental that are random. This gives a sound without a definitive pitch, such a car door shutting, or the cymbal of a drum kit, which contains inharmonics. The human ear is limited to what pitches it can hear. We can’t hear a dog whistle because its frequency is too high (ultrasound). On the other end of the frequency spectrum is infrasound, which is too low. Anything audible to the human ear is within the frequency range of 20Hz to 20kHz (20,000Hz) and the majority of recorded music exists within this range. 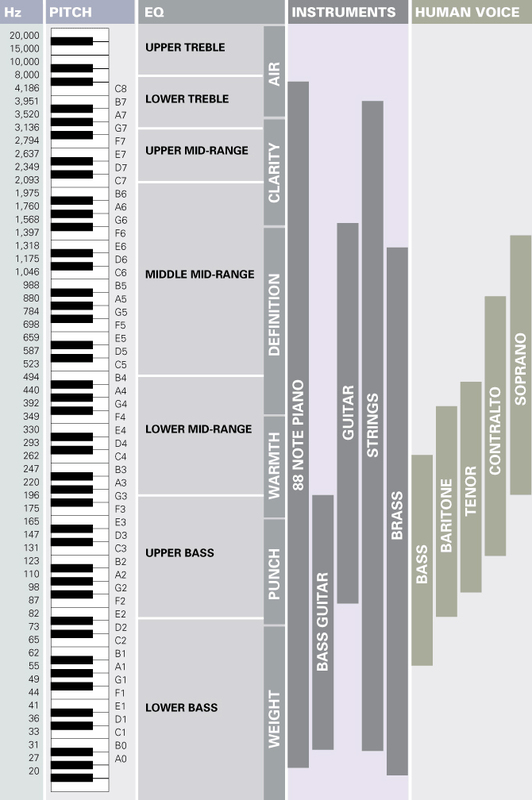 Below is a graphic of musical instruments across the audible frequency range. To avoid confusion these are the ranges of the fundamental frequency that we hear as the note’s actual pitch, as spoken about earlier. The harmonics above any given fundamental will therefore coincidentally fall both within and exceed the instrument’s range. With equalization (or “EQ”) you can adjust the volume of different frequencies, changing their proportion to each other. Some examples of this would be the graphic equalizer on a Hi-fi or simple Bass / Treble dials of a stereo system. Guitar and Bass amplifiers have them as dials for bass, middle and treble and there are also usually adjustable knobs on guitars and basses for these. When you alter these you are adjusting the volume of the harmonics. Whithout knowing this you might wonder how adjusting the treble on your guitar actually makes a difference to its lower notes. Volume is measured in decibels (dB). 0dB is the point at which sound only just starts to become audible to the human ear. There is sound below 0dB but it’s so quiet the human ear can’t hear it. The highest volume the human ear can hear is 120dB, which is where it starts to hurt, so best avoided. The human brain and ear are so good at translating the sound waves we hear into our perception of that sound, that man made inventions have a lot to deal with to come close. This is why there is often more to getting a recording to sound how you want than simply recording it, and alot of things going on inside a device that does.